Aija Mayrock, author of "The Survival Guide to Bullying," doesn't believe bullying will ever end — but we can all help lessen the problem. Aija Mayrock is one of our 2018 TODAY Style Heroes. Click here to see the full list! It's been years since Aija Mayrock experienced what she calls her "lowest low": seeing a photo of another teenager — someone she had never even met — dressed up as her for Halloween, all part of a cruel high school prank. "She wore clothes to make her look larger or sloppy or dirty, and she put a sign with my name on it around her neck," Mayrock told TODAY Style, recalling the painful bullying that, in part, encouraged her to write a book at age 16, "The Survival Guide to Bullying." Mayrock, now 23 and a rising senior at New York University, is now an activist on a mission to stop bullies. "Here's the thing about bullying," she said. "I don't think it will ever go away, but I think there's so much we can do to lessen the problem." Part of that is inspiring confidence and body positivity in young people, particularly girls. "I think the way young girls are raised in this country is that we're never good enough," she said. "That we can't have both — we can't be smart and beautiful. We can't have a strong voice and be accepted." "What I want every girl to know is that you are beautiful, with all your imperfections, with everything," Mayrock continued. "For me, I was overweight. I had a speech impediment. I didn't shave my legs. And I loved myself! But then, as I got older, I was targeted for those things." Her own experience has made her a relatable role model for young people, whom she talks to in schools and communities across the country, flying to events in between classes in New York. Mayrock remembers her own experience being bullied vividly, which she shares in her book. "I had a lisp and a stutter, and I was a really creative kid," she said. "I marched to the beat of my own drum. I think it started because of the way I spoke, and then I never really stood up for myself. I would come to school, in third grade, and people would tell me that my life was worth nothing and that I should just kill myself." She recalls classmates mimicking the way she spoke and, later, the cyberbullying event that crushed her. Mayrock had recently moved to California from New York, where she'd been harassed by peers for her speech impediment and how she looked. She thought she'd escaped the bullies and was happily settling into her new home, but apparently, she was still a target at her old high school, even when she was no longer a student there. Mayrock learned about the prank from a friend who sent her a text message: a photo of another student, someone she didn't even know, wearing baggy clothes and a sign around her neck that said, "Aija." Soon after, the photo went viral. "The thing that was so upsetting to me and really inspired me to begin my work was the fact that the school, who knew who I was, who had just had me in class a few months before, tolerated it," Mayrock said. "No one said, 'Take that sign off.' When she posted it online, those same teachers and educators did nothing." "I wasn't thinking, 'What can I do to make a difference?' at that point, because I was depressed and I was still trying to build myself back up," she continued. "But around that same time, I saw there were so many teen suicides on the news due to bullying, and I was so angry that those young people felt there was no hope. It infuriated me because I wanted to help them. I wanted schools to help them. I wanted other young people to help them." "I was so angry that those young people felt there was no hope. It infuriated me because I wanted to help them. I wanted schools to help them. I wanted other young people to help them." 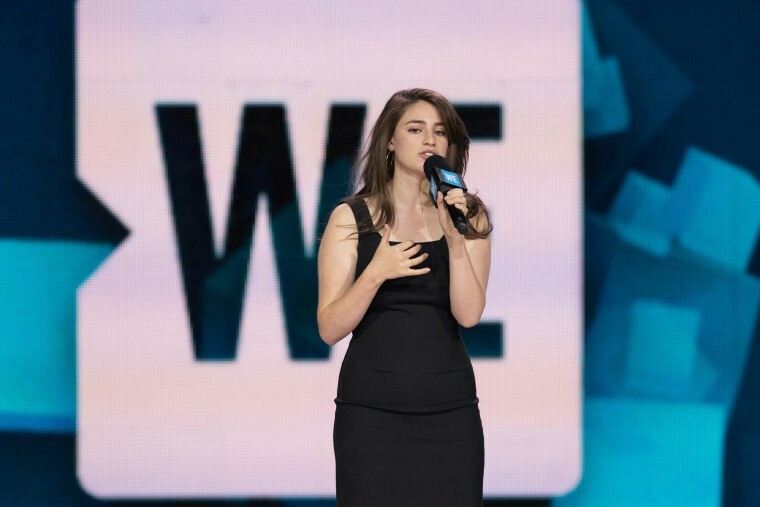 So she wrote the book, "The Survival Guide to Bullying," which she describes as "the book I never had but always wanted," and includes "survival tips" for kids who are being bullied. Sample tip: "Repeat this three times a day: There is nothing wrong with me." Mayrock self-published the book in high school. It was later picked up by Scholastic and an updated version was published in 2015. In an age when suicides among young people are on the rise, she hopes her book, and her continued efforts to connect with students, help them feel less alone. "I really felt there was no one in my life who understood me, and who understood what I was going through," she said. "Those feelings of being isolated build up. They're terrifying. That's part of the issue with young people and self-harm and suicide. They really believe they're the only one going through this, and there is no one to help them, and that is never the case."